To begin this week’s article, I want to give a shout-out to Jack and Sarah Goosetree from Gillette, Wyo. As I travel across this great land, I am amazed at how many non-Okies read the Baptist Messenger. Last weekend, I spoke at the Goosetrees’ church, stayed in their home and learned that they are ardent Messenger readers. Sarah is the hostess with the mostest, and Jack fixed me his award-winning brownies to carry back home. Without Jack, I would have starved to death in the airport. My plane had mechanical problems and was grounded in Denver, so it took me 14 hours to reach Tulsa. I finally arrived home at 3:30 Monday morning, knowing I had to appear for jury duty at 8:30 that same day. I had barely closed my eyes when the alarm went off. I arrived on time and had been in the jury pool only a few minutes when a young man came over, sat down and said, “Aren’t you Walker Moore?” When I told him I was, he said, “I recognized you from your picture in the Baptist Messenger.” That means . . . you all know what I look like when I’ve had only three-and-a-half hours of sleep in two days. This reminds me of something else. Do you know that you can go online to read, download or print out each week’s article? The online version of the Baptist Messenger is a wonderful way to share articles with your family, friends or church family. I also want to make sure you know that most of my articles are archived on the Baptist Messenger Web site. I keep getting letters and calls wanting me to send the article I wrote a couple of weeks ago. There’s just one problem: the one you’re reading today IS the one I wrote a couple of weeks ago! 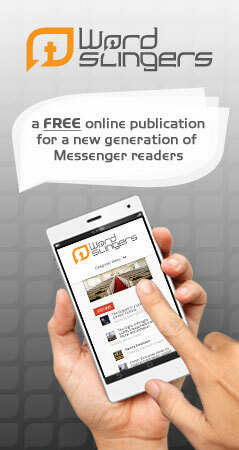 To find my articles, simply go to www.baptistmessenger.com. Click on the current article (left side, near the top of the home page). This takes you to the next page where you will see “Rite of Passage Series” to the right of my article. Click that link and you will see a list of past articles that you can read, print or pass on by e-mail. You can also send me a note. I enjoy almost all the notes that come my way (thanks, Mom). To return to jury duty . . . here in Tulsa, the jury assembles in the basement of the county courthouse. There I waited amidst 300 strangers, from professionals to street people, from young to old. I was reading a book to pass the time when a second young man came and sat down across from me. His body language indicated that he wanted to talk. I put my book down and listened. I noticed almost right away that the sole of my new friend’s right shoe was broken in half, with a hole above the break. As his story grew more intense, he crossed his legs and turned his broken sole perpendicular to the floor, inches from my knee. Suddenly, I saw a flash of pink move within the hole. It began to push, and suddenly, out through the hole popped the young man’s big toe. I was trying to listen to his story, but his big toe began looking around outside his shoe. It looked down, to the right, to the left and up toward the ceiling. The way this toe was moving around, I was sure it had eyes and a brain. Strangely enough, the young man never seemed the least bit aware that his big toe had escaped. Do you know how hard it is to concentrate on another human being when a big toe has been set free? Extremely! I decided to compromise. With one eye, I watched the young man. With the other, I stared at the toe. It couldn’t seem to find what it was looking for, so it disappeared back into the shoe. In about five minutes, it returned through the hole and followed the same routine, roaming around as though foraging for food. Finally, the young man finished his story. As quickly as he and the big toe had come, they left . . . and I said a prayer. This incident reminds me what it was like when my sons were going through the teenage years. Sometime they acted like mature, responsible adults. The next moment, they were sticking their toes out of holes in their shoes. During these transitional days when my boys were moving from childhood into adulthood, the Lord gently reminded me that I needed to listen (regardless of how hard it was), concentrate (even amidst distractions) and pray for their souls. Or was it their . . . soles?